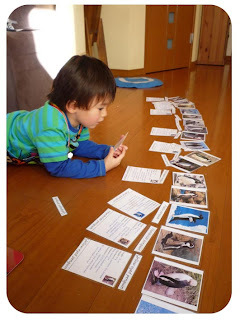 Then I asked him to do the same but find the tallest, so he went through them all until he found the Emperor Penguin. I like to keep him on his toes, so I then asked him to put his coat and shoes on and get his chalk out - this totally threw him since we were in the middle of 'work'. 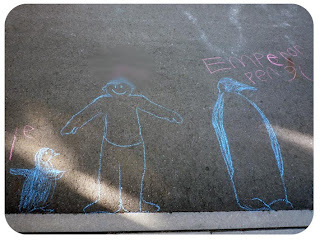 I grabbed the tape measure and together we measured the height of little penguin on the road, I drew the outline and Ebi-kun coloured him in, then Ebi-kun lay down and I drew around him, he is 105cm and finally we measured the Emperor penguin, who is 110cm. Ebi-kun labelled them all, he was quite surprised to see how big the Emperor is. 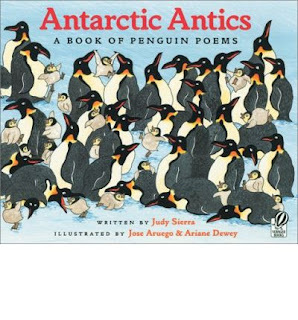 We went back inside and then read a couple of poems from Antarctic Antics which is a very cute book and funny too, and how many little boys wouldn't love a poem called regurgitate? He also read Antarctica (Rookie reader) but Ebi-kun complained that it was too easy! the one thing I didn't like about this book was that they have some words with the pronunciation in brackets but the pronunciation is American English. Ebi-kun read the word then the pronunciation and asked why they had done that, it doesn't make sense, I have to agree. Nice pictures but I don't think we will be buying any more books from this series. 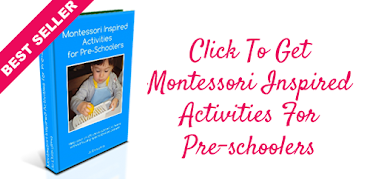 That is a great idea re the measurement! Love it! Thank you.